The 30 second elevator pitch for Workaway goes a little something like this: Workaway is a cultural exchange where you live with a family and do various tasks & chores (5 hrs/day, 5 days/wk MAX) in exchange for room and board. The tasks & chores could be anything from watching kids, tending to animals, helping with the garden, or even just living in their house and speaking English (or other foreign language). 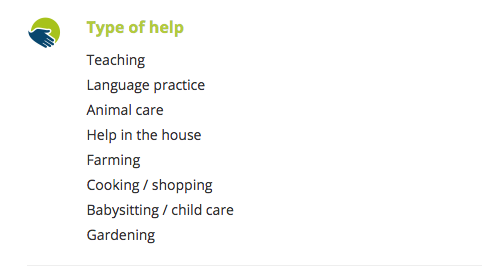 A lot of the purpose of you being there is helping them around the house/doing whatever they need, but the biggest part is the cultural exchange bit. Everyone who signs up to be a host is fully expecting you to come and tell about your country and customs, talk about your own world views and are eager to show you their way of life. Okay maybe that is a little bit more than a 30 second pitch, but it’s so hard to explain the rich experience you can get from doing a Workaway concisely. I would suggest this type of traveling to literally anyone: you can be married, single, a student, unemployed, done a lot of traveling, never traveled before, whatever you are and whatever experience you have there is something on the website for you. For me, this was my first experience traveling and I would recommend it to anyone who is feeling a little nervous to travel internationally for the first time. Living with a family seems a little daunting and scary, but I truly believe it is the best way to experience culture and ease into everything. I still get teary-eyed when I think about my first couple of days with my Workaway family in Mondovi, Italy. I was so scared to be traveling so long and so far away from everything I knew, but immediately I felt at home with them. They were so intentional about making me feel comfortable — definitely making sure I was never hungry — and that didn’t waver once while I was with them. Although 5 weeks is short for a Workaway stay, I felt it was the perfect amount of time to dip my toes in. To be completely honest with you, not every day was a crazy enriching experience, but there certainly were days like that. During my 5 weeks in Mondovi I managed to read all of the Harry Potter series and became an expert at ironing bedsheets. I played a lot of badminton and washed a lot of dishes. I learned to be content with being alone and even more than that, I truly felt like I was a part of their family. They took me on so many adventures around their town & region and brought me to a ton of community events. The best part of living with them, even with all of the adventures, was every time we sat down for meals and talked. We discussed everything in the scope of conversation and I tried something at new every meal. The food that the mom & dad made was as authentic as it can be, from gelatin + ham, to pasta every day, to sardines + pesto. How does Workaway work, and how to get started? First of all, a 1 year “subscription” that allows you to contact hosts costs 32 USD (this is for the single person account. There is also an option to sign up with a partner and that costs 42 USD). You can also add, for $8.50, a guidebook that explains the philosophy of the organization, tips on being a workawayer, and anecdotes of others’ experiences. I personally did not get the book so I can’t exactly recommend it, but if you feel like you’d benefit from something like this I say you get it. Maybe having to subscribe to the website is a turn off, I know it was for me at first, but its kind of necessary to participate. There are no other hidden fees, no “platinum level” upgrade; its just one flat fee and you’re in. You can look at hosts profile’s before you join, but you won’t be able to contact them. 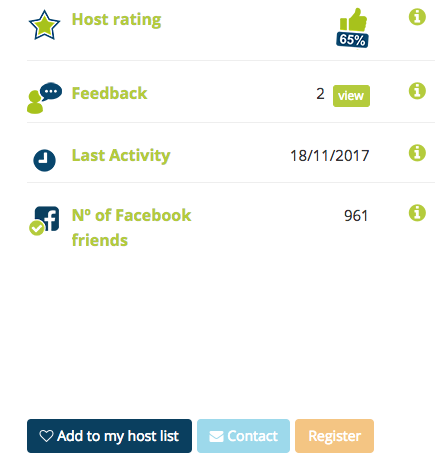 If you scroll all the way to the bottom of their profile, you can see the reviews that past workawayers left for the host and I have found these to be pretty helpful. Obviously if the workawayer didn’t have the best time they aren’t very likely to put it here because the host is going to read it, BUT it does give you a basic idea of what your day-to-day life might look like. The next step is to contact hosts. There is an email feature through the website, and it is the only way to contacts hosts. You can contact them by clicking the light blue button saying “contact.” There’s also a little mail button along the top menu to access your inbox. My best advice to you is to email as many hosts as you can. A lot of the times hosts will already have someone coming during the time you’re asking, not wanting someone like you to stay with them, or they are just not accepting workawayers at that time. If you’re anything like me, I feel I should tell you to not take it personally. These people are planning on letting someone live in their house, likely with their children, so they definitely reserve the right to be picky. This isn’t to say that it will be difficult to find a host, as many hosts will probably send you messages asking you to say with their families. I, for one, have received many emails asking me to stay with families and have declined nearly all of them because it was during a time when I wasn’t traveling or already had plans with a different host. I put everything that I am willing to do so that the only hosts that contact me are ones that are looking for these types of help. Your bio should be as rich in personality as you are. This profile is really the only way they’ll get to know you before you meet, so I will also suggest you add lots of photos to your profile so they know what you like like and have a visual of what you do/are like. Once you’ve emailed back and forth with a host and are close to deciding if you will go to live with them for whatever amount of time, I suggest you Skype with them so you can talk “face-to-face.” This will give you a better idea of what they are like and will also ease any anxiety you have about going to live with strangers. Make sure that once you’ve decided to go live with a host that you keep in contact them every so often so there isn’t any question of you’re still coming or not. If you have questions about visa/passport/etc ask them! They’re your best resource …they do live in the country you’re visiting, so they probably know better than the internet (most of the time). Has anyone else tried WorkAway? What was your experience? Thanks for sharing Becca! Wonderfully thorough write-up. I have been looking at the WorkAway website, trying to find the right host for me. I was also trying to figure out how to follow their blog via email or WordPress, but oddly can’t find a follow feature?? Thank you for your kind words! Glad to know it was helpful. I haven’t been able to find a follow button on their blog either, seems odd for it to not show up somewhere. I guess a bookmark will have to do for now!